Not very original, I know, but that is the overwhelming message that comes out of visiting the Alamo in San Antonio,Texas. I spent my formative years in San Antonio, my dad was career Air Force and was often stationed at Kelly Air Force base before it’s closure. So from age, less than a year, to age five, I lived on Seacomber street. When we returned again when I was in fifth grade, we moved to Connie Mack. The streets of San Antone have changed a lot since then, but my favorite part of the city remains. The Riverwalk and the Alamo are still as I remember from each of my many visits. The Alamo is a shrine dedicated to the heroes of Texas and preserved and maintained by the Daughters of the Republic of Texas. It is sacred ground for all Texans and to read the inscriptions you would believe that Texas would not exist without the Battle having been fought. 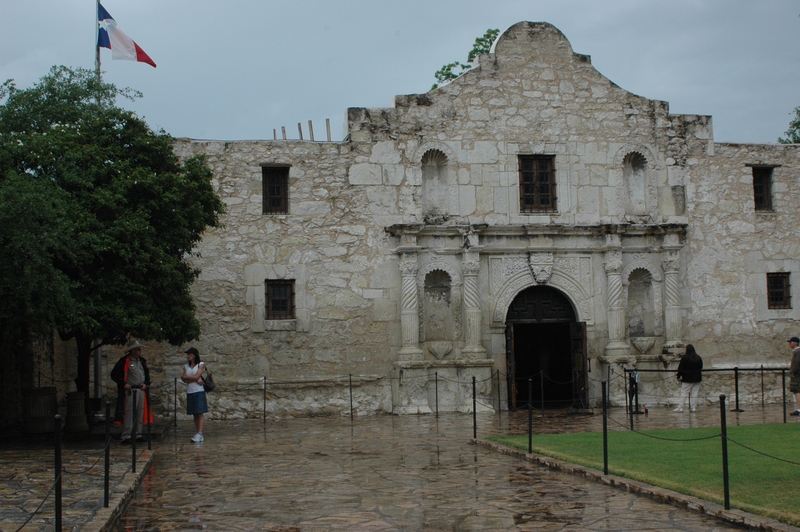 It is well documented that the heroes of the Alamo fought against impossible odds. Facing thousands in the Mexican Army of Santa Anna, the less than 200 soldiers fought hard and held off the army for 13 days. James Bowie and Davy Crockett are two of the many that died by the morning of March 6, 1836, those names live on in history. It is a shrine to be sure, a pleasure to spend time in a place so well preserved. Across from the Alamo is the famed Riverwalk, the Paseo del Rio, designed by famed architect Robert Hugman to preserve the flavor of the economic and commercial section to be solidified and preserved in it’s current form back in 1929. It’s full of restaurants and tourist shops, but is worth the trip every time. I love San Antone and am thankful to have dropped by one more time, and hopefully not for the last. This entry was posted in Uncategorized and tagged Alamo, Riverwalk by Vagabond63. Bookmark the permalink.